But once we're past the naive vulnerability of childhood, it behooves us to glance beyond our busy blinders or societal comfort zone and speak to strangers - a simple smiling hello as you pass on the sidewalk, or a conversational weather comment to your checkout line neighbor. Call me simplistic, but I t's often the simplest, seemingly small things that make all the difference in our day - positive or negative - and the unknown person next to us is not so very different from you or me. 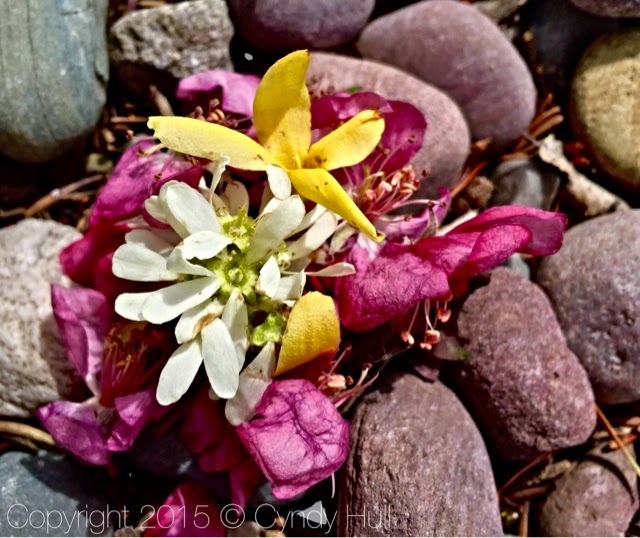 A stranger's kindness was offered to me during my Sunday river walk by way of a handful of spring blossoms along with the request, "Just squeeze this, then smell it - and look at the colours. People don't see the colour all around them." An unconventional yet lovely reminder, well worth the interruption of my best laid plans. May your day be disrupted by unexpected loveliness, and may you be an accessory to more of the same. Love serendipity. However my childhood example was a mother who engaged practically everyone - thereby resulting in children who have random conversations with - well anyone. Yes - we follow in her congenial footsteps!